Clear skin that is gleaming with health all year round… It is fantasy? No! It is real if you have facial peeling regularly! Unhealthy complexion, enlarged pores, comedones, acne and post-acne, oily sheen… There are numerous skin problems. You may have your own list. We offer a multipurpose and efficient method which solves dozens of problems at a time — facial peeling! Why is facial peeling necessary for everybody? At this age peeling is good for problem-prone skin. It is aimed at removing the upper layer of the epidermis with all its blemishes and dead cells. Your skin responds to this “aggression” by intense regeneration. As a result you have the effect you desire — clear and healthy face skin. You need peels to maintain skin in healthy condition. The cell renewal slows down with time. A keratinized layer of dead cells gradually grows on your skin. They plug your pores and create favorable environment for inflammations. You have sallow complexion, your skin is less firm and less elastic, the first wrinkles appear. 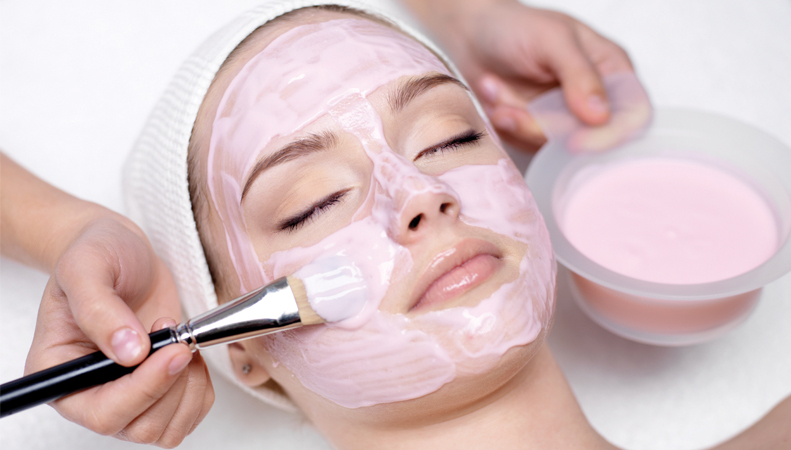 Peeling removes the “mask” of dead cells from your skin and makes it look young again. Use peeling as an efficient anti-age method. We recommend medium-depth and deep peelings for mature skin. They allow removing deep wrinkles and lines. Peeling has lots of both supporters and detractors. If you have never had facial peeling done before you can easily get confused by the variety of procedures available. The best way to get things straight is to come to a free consultation. You will meet a beautician who will tell you what kind of peel will suit you best, how many sessions you will need in order to achieve a good effect and how frequent the sessions should be. We have experienced beauticians with higher medical education working at our clinic. Their certificates and diplomas can be seen here. What kinds of peels do we offer? This is a unique non-invasive method of skin cleansing. A special device is used to act upon your skin with a jet of liquid and oxygen. Gas-liquid peeling is beneficial for everybody, including teenagers. It is not traumatic and does not require any recovery. It helps to clean your skin and contract pores, eliminate flaking and acne, smooth fine lines, improve complexion, reduce pigment spots and freckles. For more information on gas-liquid peeling click here. Call us at 8 800 700-72-87 right now to make an appointment or place your request. This peeling is carried out with the help of a device which produced ultrasonic waves. They enable your skin to get rid of keratinized cells and the excess of sebum. Ultrasonic facial peeling is a painful and atraumatic procedure. That is why it is prescribed at any age. The effect is elastic, velvety and luminous skin. For more information on the ultrasonic facial peeling refer to the Ultrasonic Facial Cleansing section (peeling is one of the cleansing stages). Acid peels are used at any age and are good for any skin type. They are used for both skin cleansing and treatment of acne and post-acne, in order to get rid of freckles, pigmentation or scars and to reduce lines. The beautician determines the required proportion of acid based on the task. combined peel comprises several types of peels to obtain the best possible result. Enzyme peel is one of gentle types of peels. It is suitable for all skin types including sensitive skin with couperose. Enzyme peel carefully cleans your skin from contaminations, oil and perspiratory gland secretions and keratinized cells. After peeling skin becomes smoother and looks bright and healthy. Please note that facial peeling is a serious procedure! Unprofessional approach can cause significant harm! One should not have peeling at dumping prices or do it at home. You have only one face for your lifetime — take care of it!